Part I of this webinar series explains the theory behind why school bus safety begins and ends with the driver. This week's event will present the actions to take to persuade drivers to change their behaviors to avoid unsafe acts. 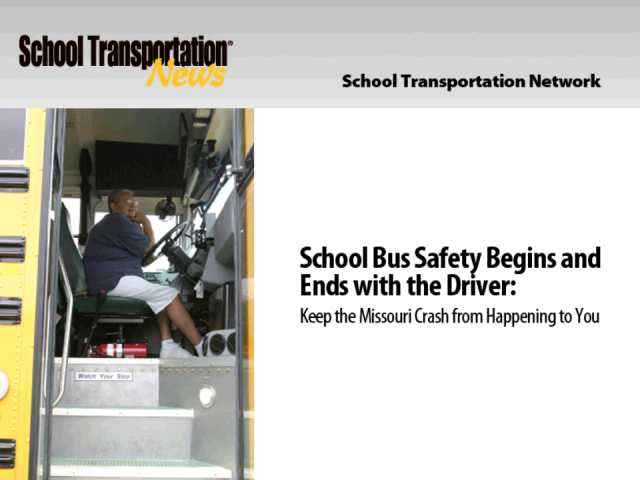 If only the Missouri school bus drivers had been four seconds back and looking ahead, the accident would not have happened. What can you do to prevent this happening in your district? Jeff Cassel, VP School Bus Safety Company & Ted Finlayson-Schueler, Safety Rules! Presented by: Jeff Cassel, VP School Bus Safety Company & Ted Finlayson-Schueler, Safety Rules!